I'm not sure that I would normally have ventured out on a cold November's evening to see an amateur performance of Legally Blonde. 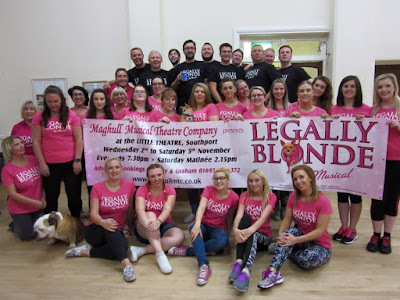 I am mightily pleased that I did accept Maghull's Musical Theatre's invitation to attend their production of the show. It was a 'wow', so much energy, so much talent and so much youth was on show, not to mention so much pink, even the band had pink tee shirts. I fully expected the two dogs in the production to have pink coats on. (Those dogs were very well behaved and some dog owners could benefit us all if they got their animals so well trained). The big thing that stood out for me was the participation of so many young people. MMTC deserve praise for their success in engaging so many talented youngsters all of whom had obviously work exceedingly hard to reach the high standard on display in this production. Without exception the principals turned in outstanding performances and the show was frequently interrupted by applause. The night I went the Little Theatre was packed the audience thoroughly enjoyed the show. Again one of the most noticeable things was that there were lots of young people in the theatre. On every level this was a success. Congratulations to the company.